We're always looking for fun ways to teach scripture stories to our young kids. I made these a while ago, just after I finished the puppet theater, but wanted to make a couple more puppets (like a girl or two) before sharing them all I won't be making more before the move, though...which means they're probably also not getting made before Chistmas...so I may as well share them. Besides my list of future projects is growing faster than I'm getting things done...so that way I can take one thing off that list. We're LDS (Church of Jeus Christ of Latter-day Saints), so I tried to make these so they would work for both Bible and Book of Mormon stories. 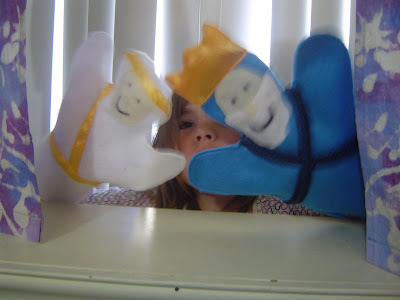 I relied heavily on inspiration from these puppets that Jennifer at The Craft Patch made. (She also has some AWESOME quiet books she's done that you should go to her blog and look at.) It's a good thing I took her advice of making sure they fit the hubby's hand because these are a little bigger than I would have made them and they barely fit him comfortably. I just had him lay his hand on a piece of paper and I traced the shape around his fingers. You could easily use felt sheets, but since it was 50% off, I went ahead and got about half a yard of a bunch of colors, so I'd have plenty for all the felt projects I have planned. As you can see from the pics, these can also double as flannel board people. Especially after I got the pattern together, these go really fast. No tutorial for this one, but here are a few tips. 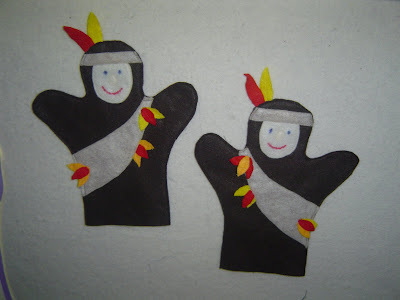 To do the faces and clothes that are made out of felt, I just experimented with cutting up the scraps. You could sew them by hand or use a glue gun, but I sewed them on by machine to the front piece. For the embellishments made of ribbon and other trim, I just used some I had left over from other projects or had been passed on to me. I sewed those onto the front, but left about a 1/2 inch hanging over the edge. 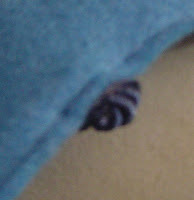 Then when I sewed the top and bottom layers together I tucked the extra inside between the layers, so it would get caught in the seam and prevent the trim from unravelling. (Sorry this picture is blurry...sometimes my camera doesn't like to focus.) For the faces, I just used sharpie markers because I figured googley eyes would last about 3 seconds with Firecracker arould. (Although you can see a few of the puppets still need their faces.) I pinned things down before sewing, and didn't use any adhesive. For the angel we opted to go wingless with gold ribbon, and I felt rather clever for thinking of using a real tie (from my awesome freecycle box) to make this other puppet. (I used the back of the tie and sewed it on with the collar, so it can flop around.) We used him as a President Monson puppet in our King Benjamin/modern-day General Conference FHE lesson, but he could also be a Bishop or even just Daddy if the daddy at your house wears a suit. 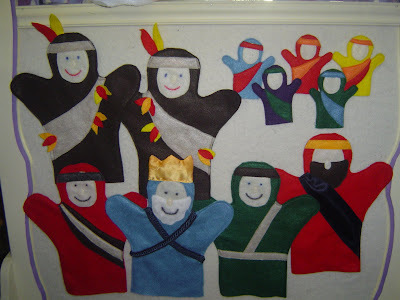 When I made the king, I made his crown afterward, so it's sewed on him straight across his head. For one of our recent Family Home Evenings, Hubby wanted to do the story of Alma the Younger and the sons of Mosiah. 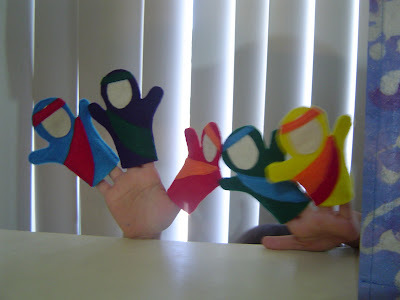 We couldn't figure a way for him to manage that many puppets, so we came up with the finger puppets. (One grown up finger or two little fingers can fit.) These could also work for stories with children. I'm sure I'll be making some more after the BIG MOVE. 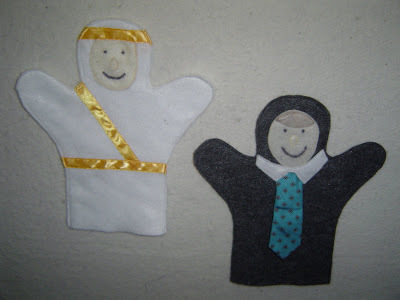 I'd like to do some scripture women, a puppet that looks like each family member and a few others. If anyone tries to make these, I'd love to see them! The Guy with the Tie could also be a future missionary! I think you have wonderful ideas! Thank you for sharing them. I cannot wait to make these for my grandchildren! They will love them. Actually, I plan to make lots of your other ideas, as well!